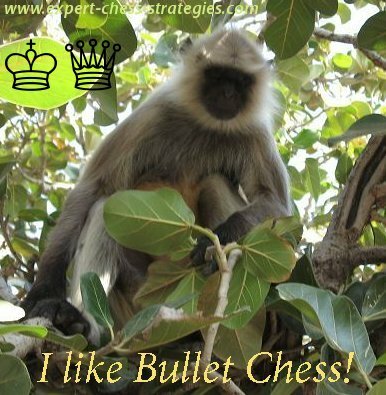 Bullet chess is played very fast at 1 or 2 minutes per side per game. I never liked this sort fo chess as I can't see any point to ruin my nerves with it. For me this is not chess at all as you just move anything you see, to avoid losing on time. There is no time at all to think and make a decent move. You just react to certain chess patterns, make moves and that's it. Even if you have a winning position this means nothing as you still can lose on time. I can't see any reason in playing it. I think an ape, who makes fast random moves will play it better than you. In Blitz you have 5 minutes per side per game and still can't really think deep enough to make decent moves consistently. It is better than bullet chess, but very annoying because often you finally reach a winning position, but you have no time to win it because you ran out of time and still lose. If you are young it might be fun to try it sometimes but older players usually stay away from this kind of chess. It may be good to test some chess openings and variations just to get the feel of it and it might help you to think faster but I doubt that you will learn to think deeply playing blitz chess. And it might strain your nervous system quite a bit. There are different rules, if a player makes an illegal move, the opponent may claim a win. For example, if a player leaves his king in check, the opponent may claim a win. Play rapid chess instead as you get sufficient time ( twenty or twenty-five minutes ) to play a decent game.